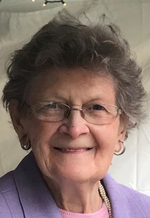 FRAMINGHAM: Mary E. (Casey) Acton, 90, a lifelong resident of Framingham, passed away suddenly Saturday Sept. 8, 2018 at Carmel Terrace. She was the beloved wife of the late Michael J. Acton, to whom she was married for 59 years at the time of his passing in 2016. Born in Framingham, she was the daughter of the late Richard F. and Lillian E. (Kennedy) Casey. A graduate of Framingham High School with the Class of 1946, she earned her BA at Regis College in 1950 and her Masters in Education from Boston College in 1952. Mrs. Acton taught Home Economics in the Framingham Public Schools until leaving to raise her family. Later, she enjoyed working at a variety of jobs including International Mailing Systems and at the Chino's Company. A lifelong parishioner of St. Bridget's Church, she was a steady volunteer at the parish food pantry. She loved knitting, reading and gardening. She is survived by her children: Michael J. Acton and his wife Miriam Smith of Bolton, MA, Kate Farese and her husband Peter of Framingham, and Christine M. Acton; 5 grandchildren: Riley, Lily and Grace Acton, and Maggie and PJ Farese; a brother Richard J. Casey and his wife Joya of Framingham; and many nieces and nephews. Visiting hours are Thursday September 13th from 4:00 to 7:00 p.m. at Boyle Bros. Funeral Home, 173 Union Ave., Framingham. A funeral Mass will be celebrated Friday September 14th at 10:00 a.m. at St. Bridget's Church, 830 Worcester Rd., (Rte. 9 Eastbound) Framingham Centre. Burial will follow in St. Stephen's Cemetery, Fenwick St., Framingham. In lieu of flowers, her family suggests memorial donations be made to the Regis Fund, c/o Regis College, 235 Wellesley St., Weston, MA. 02493. For memorial page, please visit www.boylebrothers.com.